Apple today has released iOS 4 for iPhone 3GS, iPhone 3G, iPod touch 3G and iPod touch 2G to public as a free download via iTunes. This is the same build 8A293 which was released as GM candidate on June 7th. For those of you who don’t know, iOS 4 was formerly known as iPhone OS 4 and was renamed to iOS at this years’ WWDC 10 where iOS 4 was first released to developers. iOS 4 is fully supported on iPhone 3GS and iPod touch 3rd gen. And, for iPhone 3G and iPod touch 2nd gen, they will run many things, but not multitasking (unless you know where to look for it). An iPad version of iOS 4 is expected to be released by fall 2010. To update to iOS 4 for iPhone, all you need to do is to connect your iPhone or iPod touch with your computer via USB and start iTunes. You should now see a message as shown below. 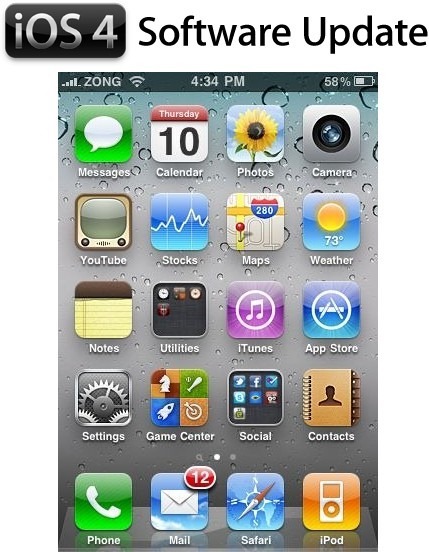 Simply click on “Download and Install” button to get on to the new iOS 4 firmware. Note: All iPhone jailbreakers and unlockers are highly recommended to stay away until new tools (which are very expected soon) are available for jailbreaking and unlocking this new firmware. You can follow me on twitter or join our facebook fanpage to keep yourself updated on all the latest iPhone related releases. hey u dowload it have you got any problems abaut 3gs write please ! is it possible to install the iPod Touch 3G version on a 2G iPod Touch, so as to get the extra features? did not work!!! IPSW file not recognised! If you got the message “IPSW file not recognised” your ipsw software version is incorrect. The version must be 4.0.
go and update it then it will work because i had the same always then i saw youtube and a link and downloaded it and it worked! how do i make the windowsrar to a usable file during restore?? ?